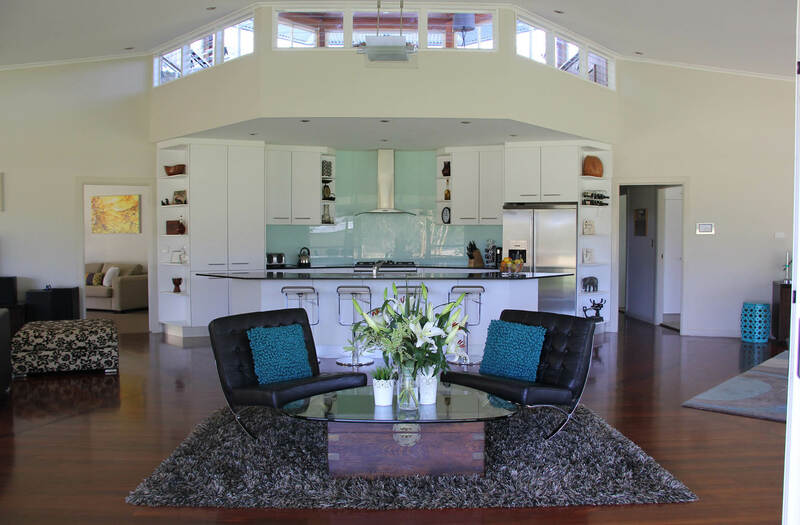 The rotating house was designed and built by it’s present owner, Luke Everingham in 2006. It is octagonal in shape and surrounded by a circular exterior verandah the whole house and verandah turn 360 degrees each way. There is a fixed extended deck that does not turn with the house and is always on the riverside of the property with an outdoor sitting area. A touch screen in the dining room controls the rotation. This allows one to take advantage of the seasonal changes, like following or avoiding the sun, moving the lounge-room to catch the breeze or perhaps you would like to take advantage of the views like waking up with the river in view, dining by the riverside just to name a few. A full 360-degree rotation takes approx. 45minutes so you can hardly notice you are moving. The Study is the same size as the bedrooms and has a PC connected to the Internet ready to use. There is large open desk for those that have some work to squeeze in and an upright piano for those musical moments. This room doubles up as Bedroom 4 when needed. 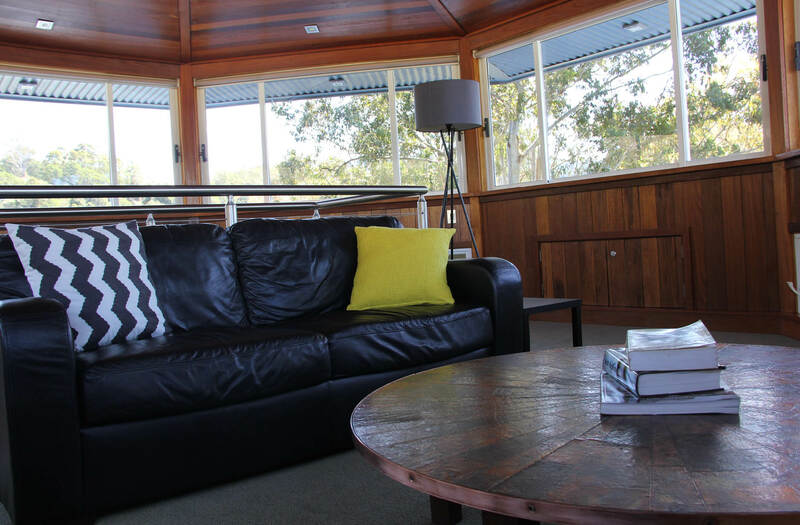 The observatory on the top floor is the perfect getaway room with 360 degree windows looking out to the beautiful bush landscape, a comfy lounge setting makes for a perfect chill out / reading room. The observatory is also a multipurpose area with a TV/DVD mounted to the lower wall & 4 bar stools with a dry bar table – great for an afternoon drink overlooking the valley. The observatory doubles up as Bedroom 5 when needed. 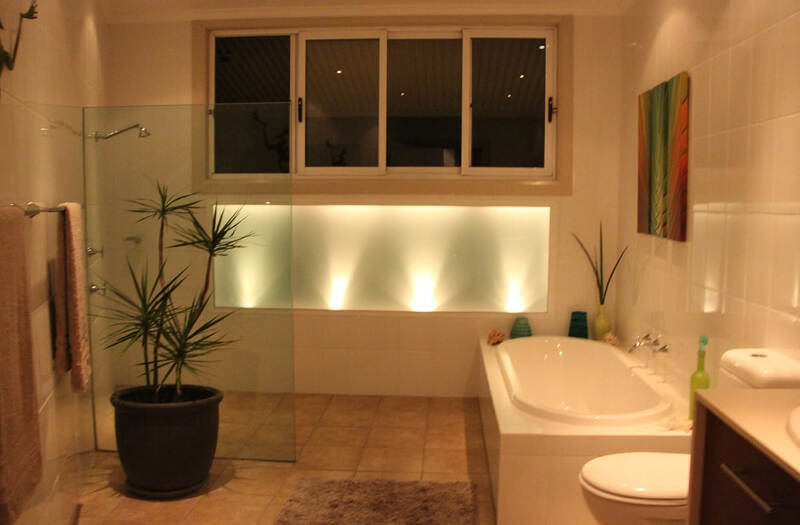 The main bathroom is spacious and luxurious boasting bath & separate shower recess, toilet and vanity. There is an ensuite off the main bedroom. An outside toilet is accessed directly off the verandah. 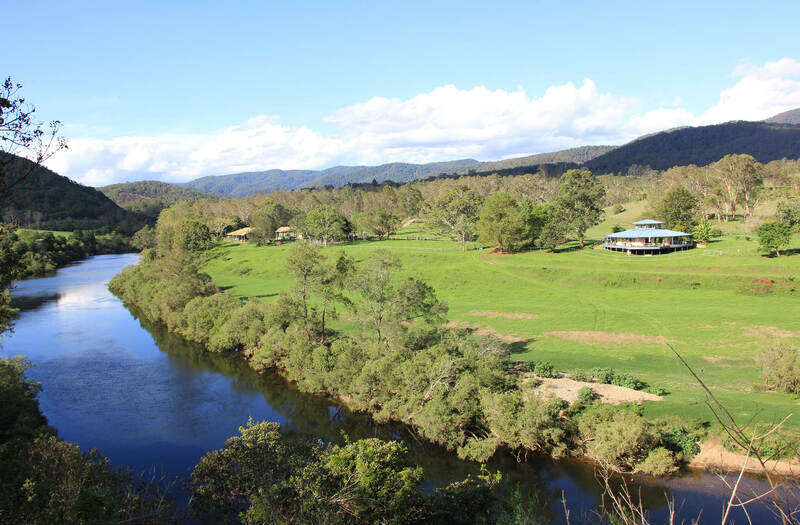 Our property is stunning as we are in the middle of the Manning Valley – our property is like a big pie shape as the Nowendoc river wraps around us like a semicircle. Giving us 850 mtrs of natural river frontage.. The river is fresh water and is so refreshing to swim in. The width of the river varies but can be as wide as 50mtr in some places. It is so tranquil and will make you feel at peace with nature. Spend the day on the banks of the river – take some camping chairs have a camp fire. 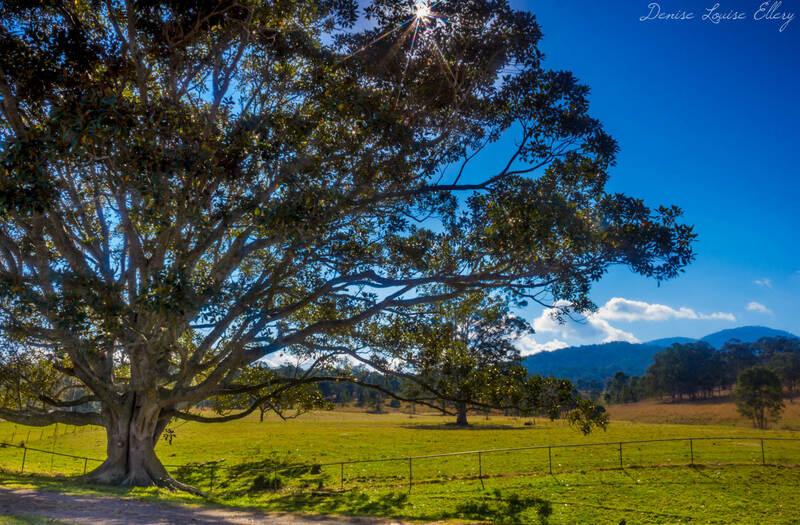 We also have 2 horses on the property which are never to far from sight, you will most likely see Kangaroos and Wallabies passing by and a huge array of birdlife especially eagles and kookaburras. All animal vaccinations must be up to date and supported with a certificate from the vet before we can allow them to stay at our property. Dogs must also be treated for fleas no later than 1 week prior to arrival. Dogs are NOT ALLOWED inside the house at all. Guests need to ensure current vaccinations are in place. Guests need to bring food required, & must clean up the areas occupied by their animals before departure. Dogs must be of a good nature, & expected to be comfortable in the area provided without excessive whining / barking such as might disturb surrounding properties. 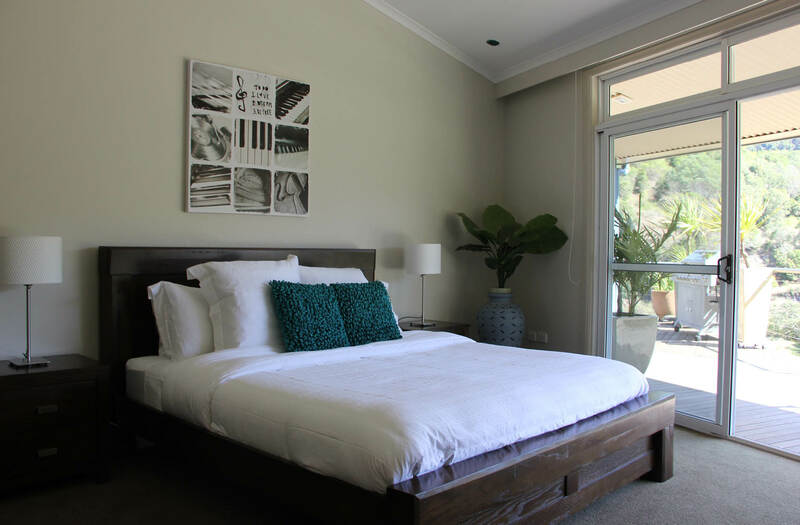 Guests should bring a favoured toy, blanket & ample bedding. 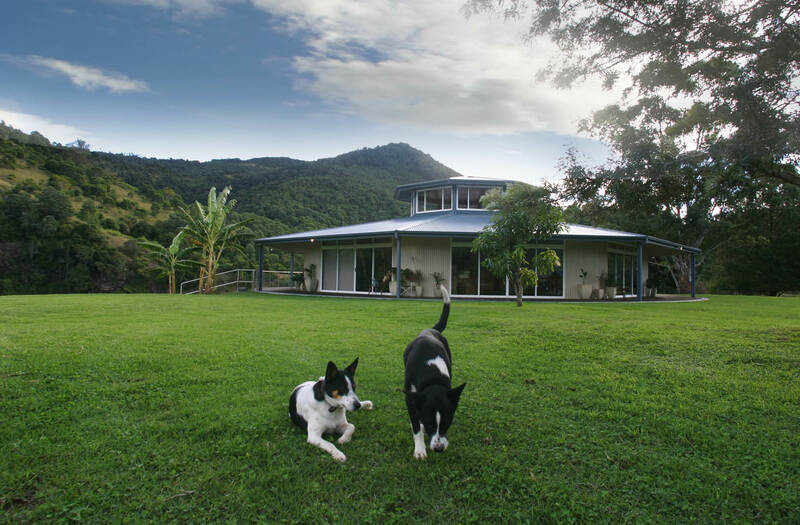 A number of conditions apply and need to be agreed to in writing prior to your stay; for example dogs are not allowed inside the rotating house and dogs must be kept on a leash when outside the rotating house paddock. You can enjoy riding the beautiful surrounding countryside, be close to participate at local events & country shows. Yarding of horses is effected in our well-sheltered cattle yards. The yards are constructed with a 5 rail gal’ pipe and holding paddocks are post and rail electric fence. – Water troughs available – easy access & ample parking for horse floats. Guests will be required to indemnify us for any damages to property, for any excess cleaning required, &/or in regard to injuries to any persons. A minimum $400 bond is required against such eventualities. Prior approval is required for all visiting animals. A written contract must be completed before bringing your animal to Longview. We reserve the right to require that any un-acceptable animal be removed from our property & without any compensation being payable. We will not accept any liability for injuries sustained by animals whilst visiting Longview Farm. and remember, our pet friendly services are FREE ! PLEASE NOTIFY US WHAT BEDS YOU LIKE TO BE MADE FOR YOUR STAY. Although we provide some very basic complimentary jams and spreads you will need to bring your own food for your stay. For those travellers unable to bring their own food – we can arrange a food hamper for your stay – for the price of the food and a $150 fee. We recommend proper footwear when walking around the property (no thongs). We also recommend river shoes for swimming in the river (available at BigW for under $10 a pair). We have a strict no shoe policy for when inside the house. If you intend on going bushwalking we strongly advise you to cover your legs in full for safety against insects / spiders / snakes. The Australian sun can be very harsh and we recommend you bring a high UV protectant Sunscreen/ Hat and sunglasses for when outdoors. As with any environment there are many hazards on a farm. Wild life and domestic animals, flora and fauna and electric fences. The hazards are there but a common sense approach will prevent any injury and determine the difference between adventure and injury. Please note that our fences are electric – please notify us if anyone staying has a medical condition that may be severely affected by electric shock. E.g. Pace makers. Children are not permitted beyond the house paddock without adult supervision. Please do not run but walk around the animals. Do not crowd farm animals; a cow with a small calf at foot is very protective and will charge if it feels threatened, so give them plenty of room. Children are free to roam within the house paddock – however adult supervision is suggested. 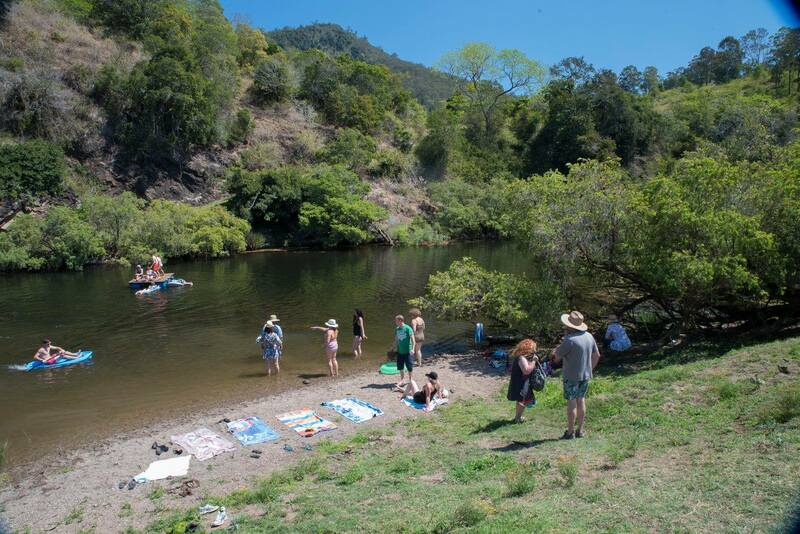 River activities – require adult supervision and if using a kayak – life jackets are to be worn at all times. When making your way around the property please ensure all gates are closed OR open as you found them. Shoes must be worn at all times on the property. Shoes are not to be worn inside the house. No admittance under the rotating house. Please be conscience and turn off all lights when not in use. your accommodation is self contained and as such you need to supply all items you would require in running your own home. If you shall have additional guests than originally agreed to then written notification should be given 7 days in advance. Additional payment will be required. We reserve the right to alter any of the Terms and Conditions stated in this waiver without prior notice. If you intend on going bushwalking, you do so at your own risk. We strongly advise you to fully cover your legs and feet for your own safety. The house will be cleaned prior to your arrival. Some basic cleaning products will be provided at the commencement of your stay. The house should be left in a similar state to that of arrival, with the exception of linen and towels, which will be changed when, you depart. We supply you with some cleaning products, a mop, bucket / cleaning sponges, a broom / dust-pan to enable you to keep the place clean during your stay. You may need to replenish these cleaning products during your stay. 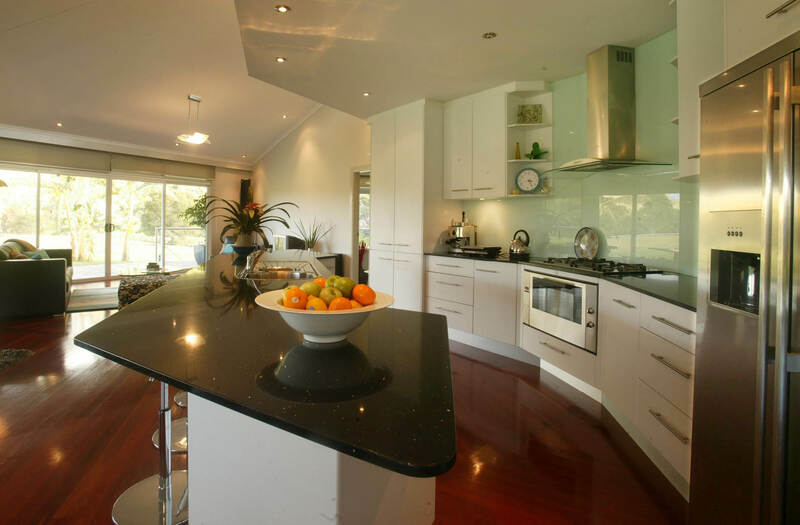 The Property must be left in a clean and tidy condition. All furniture and furnishings must be left in the position they were in when you arrived. The property should be vacated on time and secured. All windows and doors are to be locked, all electrical appliances switched off. All breakages, damages, lost or missing items are the tenant’s responsibility during the stay, and must be paid for, plus time & effort involved, with the charge made against your credit card to cover replacement or repair costs, but not limited to. Cancellations less than 28 days – no refund on full accomodation cost. 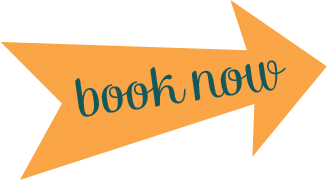 Once we have confirmed your booking, we will accept changes received from you within 48 hours of the initial booking. We will endeavour to accommodate any changes outside of this time, however due to occupancy, this cannot be guaranteed. Changes cannot be made on the day of your stay and full advanced deposit amount (50% of full fee) is required. We reserve the right to refuse accommodation if the payment is not made in full (see Changes & Cancellations). No refund will be granted in case of early departure during your stay. Travel insurance should be sought to protect you against any unforeseen changes to your travel plans. As with any environment there are many hazards on a farm. Wildlife and domestic animals, flora and fauna and electric fences. Hazards are apparent but a common sense approach will prevent any injury and determine the difference between adventure and injury. Please note that our fences are electric – please notify us if anyone staying has any medical conditions that may be affected by shock. Children are not permitted beyond the house yard without adult supervision. Minors must be supervised at all times. We are not liable under any circumstances for loss, theft or damage to your property/ belongings, or personal injury. We advise you to purchase travel insurance to cover unforeseen circumstances such as injury and/ or loss/ damage to your personal belongings. The security of the house, it’s contents and your personal belongings are your responsibility during the rental period. If items are not claimed within 14 days they will be given to a local charity. If you want items posted back to you, there is a Cash on Delivery TBA charge incurred. From time to time items may break or get damaged through normal wear and tear. We will endeavour to repair or replace these items as soon as possible during your stay, however we cannot guarantee rectification of any incidents during your stay due to external factors e.g. trades person availability, weekend and public holiday operating periods etc. Keys are to be collected by the nominated person on the booking agreement application. Credit card and Identification (Australian Driver’s License or valid passport). If you’re unable to collect the key in person you may nominate another person from your group to collect the key and will also be required to provide the required documentation. The signed check-in form remains the property of The Rotating House at Longview Farm. Moving any of the furniture inside the Rotating House expect for dining chairs. It is a breach of the Terms and conditions to have additional guests stay at Rotating House without the consent of the the owners. To do so will result in a fee of $400 per adult and $200 per child. Being in a remote part of NSW we have no control over outages caused by third party interference. We will always do our best to rectify any issues in a timely manner. But can not accept any responsibility for any inconvenience caused as a result. The number of Guests should not exceed the number stated on the booking confirmation notice or subsequently agreed in writing or e-mail. Fees will apply for excess guests not agreed with the owners in advance in writing, and may result in termination of rental in severe cases. Total guests will also need to be in compliance with the State Fire and Safety Laws. All animals vaccinations must be up to date and supported with a certificate from the vet before we can allow them to stay at our property. Life jackets to be used when if using any water craft. The security bond $1000 per booking is also required at the same time the balance is due, but is not limited to, any outstanding charges, and/ or the repair or replacement value of damage or loss to the property regardless of the amount. You are also liable for any time and effort involved in replacing or repairing any item that has been damaged or lost / stolen. The security bond may also be used to cover any additional cleaning costs (see “Cleaning Fees”). The security bond cannot be used for any part of the tariff during the stay. The security bond is refunded within 14 days subject to the terms and conditions being met. Our accommodation is self-catering. All the facilities to cook & clean yourself during your stay are provided for your use. It is your responsibility to keep the house clean. We provide you with some cleaning products. We also supply you with an initial amount of soap, toilet paper and washing detergent. However once that runs out, it is the responsibility of the occupier to replenish. We recommend proper footwear when walking around the property (no thongs). 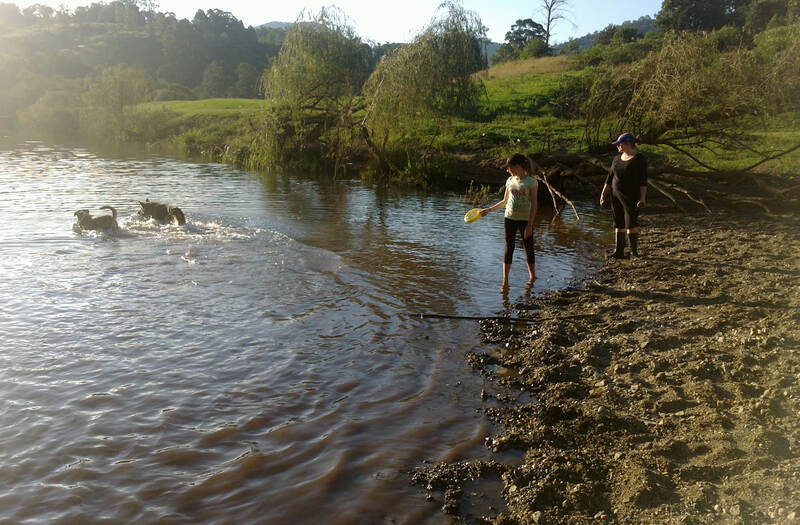 We also recommend river shoes for swimming in the river (available at BigW for under $10 a pair). We have a strict no shoe policy for when inside the house. 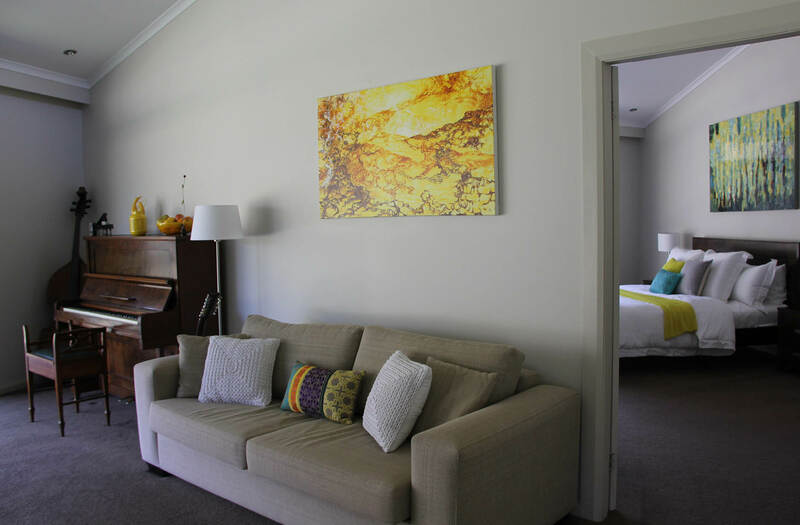 What is included in your accommodation cost? Some essential toiletries – soap, shampoo, conditioner. Some basic cooking supplies – Salt, Pepper, sugar, dried herbs.